In my last few days in Bismarck I’ve been observing the flooding of the Missouri River in town. Due to unexpectedly heavy spring rains in eastern Montana and above average snow pack in the Rockies, the Missouri river has been running higher than it has in over 50 years. Lake Sakakawea, the reservoir behind the Garrison Dam got so high that the Arm Corps of Engineers had to open the spillway gates for the first time ever. 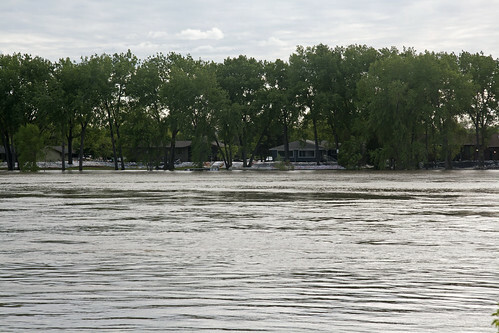 In Bismarck, the river is flowing over 5 times faster than what it usually is this time of year. At my last check the river level was near 17.7 ft. and projected to crest over 19.5 ft.
What makes this a little different from your normal spring flooding is that this isn’t a week-long affair. The water could stay as high as 17ft well into August. Already the high level and flow have begun to scour away at the banks of the river. If it lasts for months, some bends could be completely different from before. 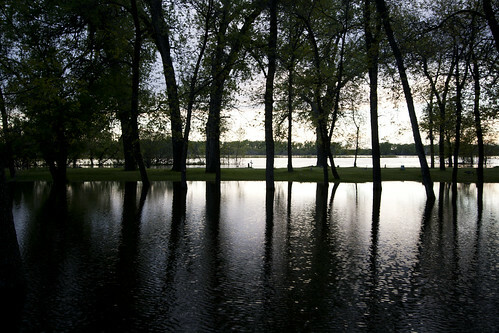 In Bismarck, the southern third of town sits on the flood plane. Everyone has been sandbagging and diking for about two and a half weeks. Some of the people outside of the city limits and protection zone also went straight to moving all of their things out of the house. There still haven’t been any mandatory evacuations, but it’s getting close. Water has been up on sandbag levies for a week now, and rising daily. Even with the sandbag levies in place, not everyone is safe. The ground under that part of town is all river sediments from being built up on a flood plane. The groundwater has been creeping up right along with the river. Some houses are sitting in a perfect sandbag levy which isn’t even touching the river water and yet, the basement is full-up with water. The water table is within 5 feet of the surface for much of that part of town. Some people still remain optimistic but with such an extended forecast of high water, others aren’t holding out much home. All we can do now is wait and see.